According to research young people are not aware of the EU’s contribution to their daily lives. 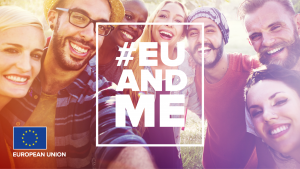 To manage this situation, in May 2018 the European Commission launched in all member states a new information campaign, called #EUandME. Its aim to demonstrate the many tangible advantages of living in the EU to Millennials and to initiating a dialogue with young people about the future of Europe. The launch of the campaign was marked by the release of five emotional and absorbing short films (‘Debut’, ‘The Loner’, ‘The Living Hostel’, ‘Party Animal’ and ‘Oona’), each one directed by a different prominent European filmmaker, supported by a wealth of information, facts and figures. 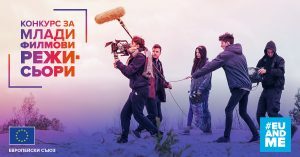 Each film aims to present one of the campaign’s themes (‘Mobility’, ‘Digital’, ‘Rights’, ‘Sustainability’ and ‘Skills & Business’) and at the same time is a concrete, authentic and genuine example of how the EU contributes to the lives of citizens in a number of different ways – such as studying abroad or starting their own business. Online hub, whose tone and style resemble the lifestyle of young Europeans, was created to collect information, facts, statistics, stories and films. Another interesting activity of the campaign is the Young Filmmakers Competition. Its participants were given the opportunity to tell their #EUandME story – a story about the EU’s contribution to the life of young people. The winners receive financial support to create their own film under the mentorship of famous European directors.